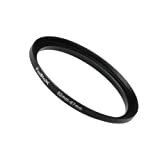 Fotodiox step-up rings are made of premium grade aluminum with precision. Every ring is inspected to ensure smooth mounting. Every ring is polished and finished with anodized matte surface for professional appearance. This step up adapter ring allows a filter/attachment with thread size of 67mm to be used with a lens with thread size of 62mm.